A frequent site on the UK’s roads, the Vauxhall Vivaro 2.0 CDTi and Renault Trafic 2.0 DCi (90PS) models make ideal load carriers for a wide variety of businesses. But with a mere 90PS under the bonnet they can struggle when heavily laden, or on long motorway journeys where fast crusing ability is vital. 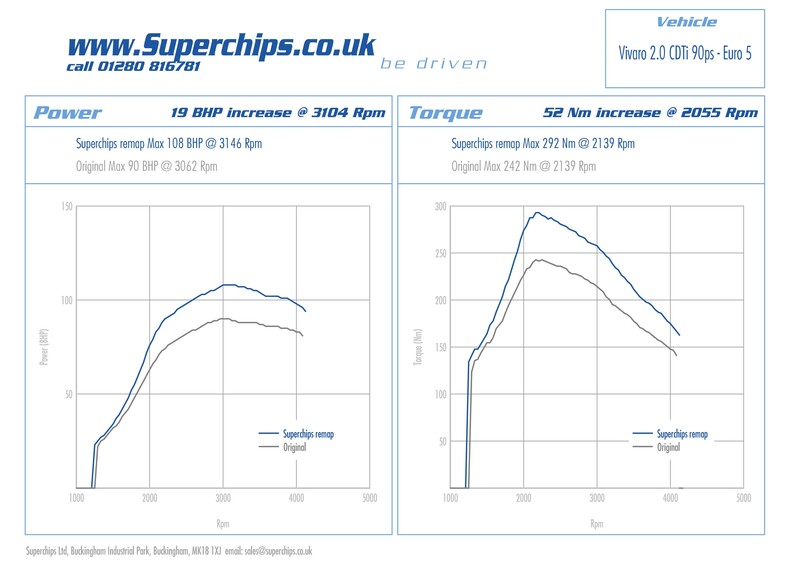 Happily Superchips now has a solution for Vauxhall Vivaro and Renault Trafic owners, in the form of two new ECU remaps that greatly improve the van’s performance. The first is for Euro 4 versions of the Vauxhall Vivaro and Renault Trafic, which produces an impressive gain of 29 bhp at just 3277 rpm, allied to an increase in torque of 62 Nm at 3149 rpm. On the road, this transforms the performance of the Vivaro and Trafic. The vans feel more responsive, torquier and more lively, enabling them to pull heavier loads with ease, while keeping pace with other motorway users. 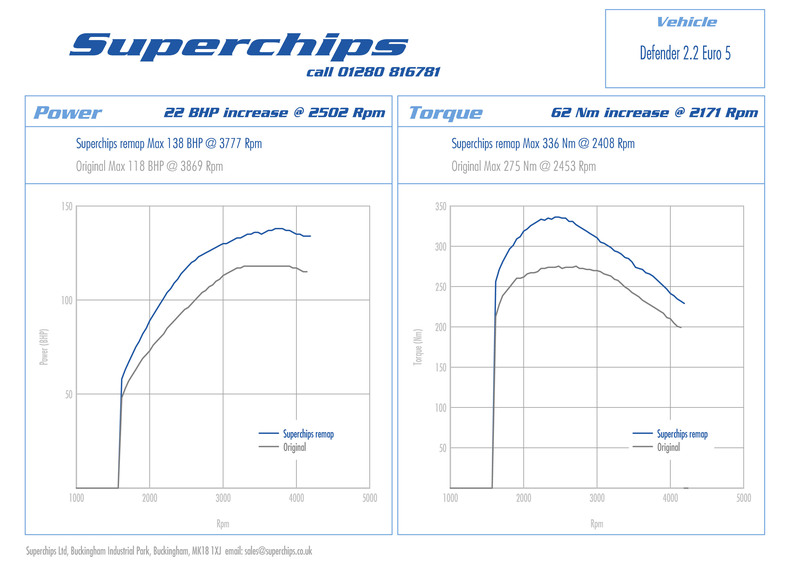 To that end, Superchips can also remove the 100 kmh (65 mph) electronic speed governor as part of the ECU remap process, if required. Available now from all Superchips’ dealers, the ECU remap for the 2006 onwards Vauxhall Vivaro 2.0 CDTi and Renault Trafic 2.0 DCi (90PS) Euro 4 models costs £430.00 including installation and VAT. 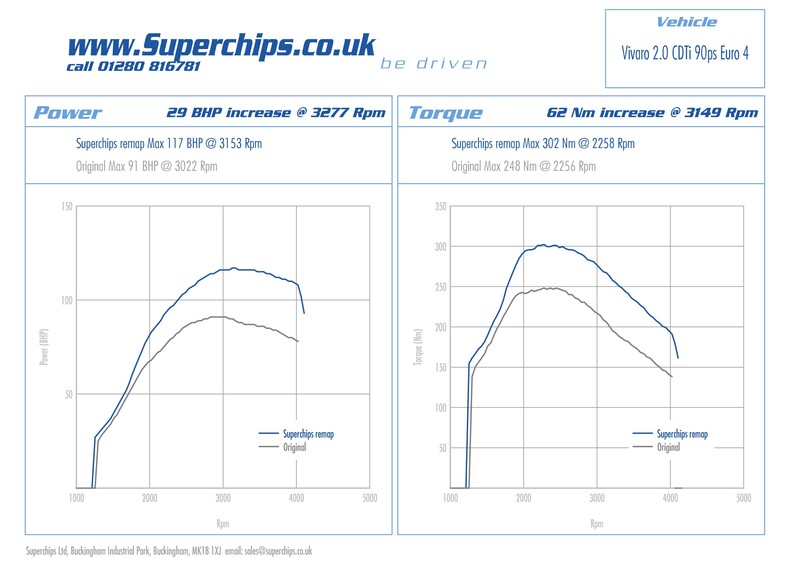 For 2006 onwards Euro 5 variants of the Vauxhall Vivaro 2.0 CDTi and Renault Trafic 2.0 DCi (90PS) the new Superchips ECU remap produces a maximum power gain of 19 bhp at 3104 rpm, with 52 Nm of torque at 2055 rpm. The price for this upgrade is £455.00 including installation and VAT. The Mercedes Sprinter is one of the UK’s favourite load luggers and Superchips Ltd, the world leader in ECU remapping, has made it even quicker! 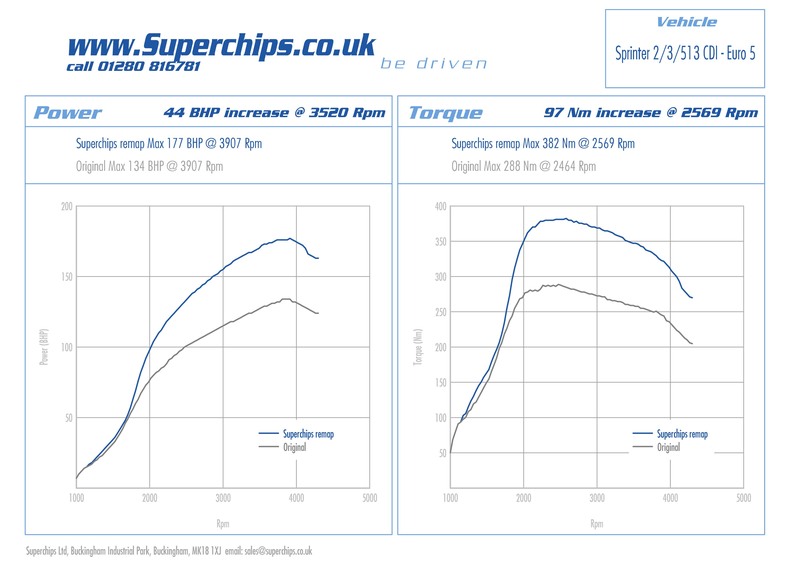 Designed for the 2143cc Euro 5 variants of the Mercedes Sprinter 213 / 313 / 513 130PS (128bhp) models, the Superchips ECU remap (or ‘chip’) increases maximum power by an impressive 44bhp at just 3520rpm, with a substantial extra 97Nm of torque produced at a mere 2569rpm. And that’s enough to make any Euro 5 Mercedes Sprinter 213 / 313 / 513 van move in style, whether on the city streets or the motorway where the extra power for overtaking and load carrying transforms the driving experience. Designed for all 130PS (128bhp) Euro 5 Mercedes Sprinter 213 / 313 / 513 models produced from June 2009 onwards, the Superchips ECU remap costs £455.00 including installation and VAT.